Experiential rehab is a major component of what we offer at Beartooth Mt. Ascent. The location of our center amongst the scenic mountains of Wyoming naturally fits into the core philosophy of experiential rehab, because it is, itself, an experience. Learn about the different aspects of our experiential rehab program, below. One of the most common examples of experiential therapy is with the use of nature and a natural, wilderness setting that is used for recovery and treatment purposes. This is usually accomplished in the form of adventure therapy, which uses invigorating activities as a way to cut through the hum-and-drum of modern life and build a person’s inner being, as you cut out the technology and endless attachment to the internet that fills a person’s life. This may involve rafting, hiking, mountain climbing, horseback riding, or any other number of nature-based activities. 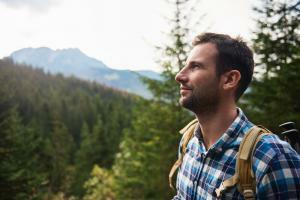 Adventure therapy is often very successful at working with young adults, especially young men. The wilderness setting around Beartooth Mt. Ascent gives us an inherent advantage, when it comes to adventure therapy and other types of nature therapy. The therapeutic use of animals is a powerful example of experiential therapy, and it is frequently used in rehabs and other treatment centers.. The most common example of this is with equine therapy, where patients help take care of horses. The act of caring for another living creature builds a foundation of responsibility and compassion, which are important traits in building towards becoming a better person, as a young man. While horses are used as the most common example of animal-based therapy, dogs are popular, as well, and there are endless examples of animals that help build the same principles. Our experiential rehab program has a lot to do with equine therapy and other types of animal-based therapies. We have a wide variety of different animals that live at our ranch, and we encourage our patients to spend time with the animals to build an emotional and spiritual bond. While expressive therapy isn’t the primary function of Beartooth Mt. Ascent, there are opportunities to practice it at our center, and we embrace the potential of a variety of different rehabilitation methods. If you have any questions about our experiential rehab program, or know a young man who could benefit from our multifaceted behavioral treatment program, then please don’t hesitate to give our caring staff a call today!